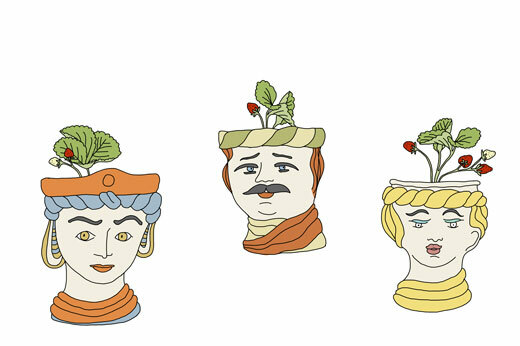 Sicilian head pots with strawberries. Coming Home from Sicily (published by Sterling Epicure, 2012) is an amazing book about seasonal farm to table cooking by Fabrizia Lanza. Fabriza is, as I have mentioned here before, the director of Anna Tasca Lanza Cooking School at Case Vecchie in Sicily. Fabriza grew up in Sicily and is a trained art historian. For many years she worked and lived outside Sicily, mostly in the north of Italy. She only visited her family in Sicily on vacations. However about seven years ago Fabrizia decided to return to Sicily to help her mother Anna Tasca Lanza with the cooking school. Fabrizia, as she says in the book, finds it as interesting to learn how to make a Cassatta as analyzing an artwork by Bottecelli. For over a year, co-author Kate Winslow and her husband Guy Ambrosino (the book’s photographer) followed the growing seasons of the vegetables, the harvest and the cooking at Case Vecchie. Kate worked closely together with Fabriza in the kitchen and collected seasonal recipes for the book. Casa Vecchie, beautifully pictured by Guy in the book, is located on Regaleali, which is one of Sicily oldest and largest estates. The estate also includes the Tasca family’s own winery. In the book, Fabrizia shares sweet personal stories about herself, her family, friends and employees. 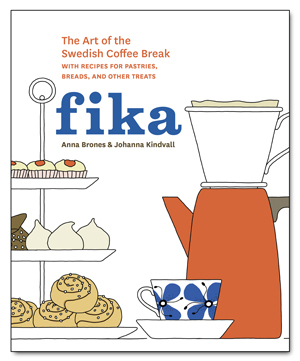 It makes the book great fun to read as well as a marvelous cookbook. It also brings back my own memories of Case Vecchie. It makes me think about the mineral flavor in the white wine paired with the panelles in the courtyard. The deep flavor of the olive oil together with the sweetest tomatoes I have ever had. And the rooster who woke me up every morning at 5am. If you have never been to Sicily, this book will surely bring you there. Some of my favorites in the book are the Pan roasted Rabbit, the fava bean pesto (Macco), the Grape Crostata and the Sfincione (Palermitan pizza). For this post I decided to bake Fabrizia’s focaccia, a recipe I especially like because of the special ingredient of one glass of white wine. I haven’t changed much in this recipe, just a few things. Instead of 1½ tablespoons fresh yeast, I used instant yeast. I also topped it with mushroom instead of the oil-cured black olives that is suggested in Fabrizia’s recipe. The bread is a simple and a perfect treat to bring to a picnic. Mix together flour and instant yeast and place it directly on your counter top. With your hands, make a well in the middle and add ¼ cup (60ml) of the water. 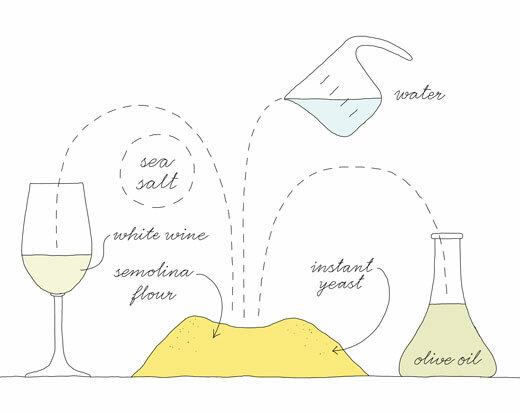 Work it well into the flour before adding the olive oil followed by the white wine and another ¼ cup (60 ml) water. Add the salt. If the dough feels too dry, add more water. Knead the dough 10 – 15 minutes (it should be a sticky dough). Place the dough in an oiled bowl and cover with a tea towel. Let rise in a warm place for about 30 minutes in a warm kitchen (I had it rising for about an hour as my kitchen wasn’t so warm and cozy). Preheat the oven to 400°F (200°C). Grease a 10 inch spring form with olive oil. Press the dough into it and let it rise for about 10 minutes more. Make dimples in the dough with your fingertips. Place the mushrooms in the dimples. Sprinkle with rosemary and sea salt. Lastly drizzle with olive oil. Bake for about 30 minutes until golden brown. I also want to take the opportunity tell you that in the beginning of next year, Fabrizia and the cooking school will run a 5 week program for chefs around the world. The program will teach the chefs the experience of farm-to-table practices, in the field, garden and kitchen.